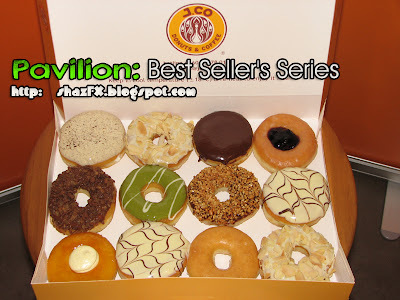 J.Co Donuts best selling donuts are...??? Well see for yourself! The pictures below are the main donuts that J.Co is selling, and yes they are the main ones. But don't fret! There are other flavors / fillings that are beign served at the same time over the counter. If you feel like trying out something new, head on over to Pavilion at Jalan Bukit Bintang... the brand new shopping mall smack in the middle of Kuala Lumpur. J.Co Donuts not only sell donuts, but they serve coffee and ice blended drinks as well. So yea, i simply love the TiraMissU donut, not forgetting the Don Mochino too! Try it all out today if you can!!! 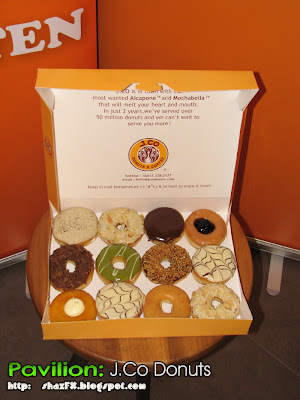 :) Not only J.Co donuts tastes awesome, but it watches out on your diet too... wanna know more? Wait till the next update about the nutritional values of J.Co donuts!! The main flavors are here... can't really remember how many flavors / fillings in total J.Co has to offer!